← The Sports Archives – Super Bowl Watch 2014! The Sports Archives – The Richest Football (Soccer) Stadium In The World? When the winner of the bid for the 2022 World Cup tournament was announced as Qatar in 2011, everyone already expected a lot. Qatar, ranked as the world’s richest country in 2012, is synonymous with opulence and a certain amount of ostentatiousness, but in addition to the high-tech facilities, impressive stadia and lavish facilities, there have been some major construction issues to contend with. There’s absolutely no doubt that Qatar means business when it comes to providing the facilities for a successful World Cup in 2022. Whilst most of us in the UK don’t have to worry about sweltering temperatures in our workplace, we know that temperature can have a dramatic effect in our work. Just how do you keep such a vast number of anticipated spectators, and teams of energetic footballers, cool in temperatures exceeding 40 degrees? Once you’ve worked that out – how can you manage it – and the running of such an ambitious venture – in a way that won’t leave a carbon footprint to rival a Yeti? Altogether, according to Dr Ritter, the total cost of the construction of stadia and facilities was likely to cost Qatar around £107billion, and a further £31billion is expected to be poured into improving the country’s transport infrastructure to accommodate enough people to double the country’s average population. The New Doha International Airport will need to be expanded, and a new port is planned in Doha to accommodate some of the fans who will be travelling to the games on cruise ships. 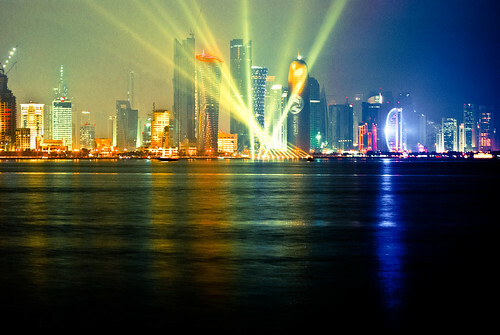 Leading firm Populous, tasked with the project of designing the Sports City stadium in Doha, are on record as saying that they wanted the Qatari organisers to do away with conventional air-conditioning and look into eco-friendly alternatives – and German-based Transsolar may have come up with a workable solution with a water-based ‘radiant cooling’ system powered by solar panels. Despite all this, the organisers are prepared to use traditional air conditioning if necessary, despite Populous director John Barrow branding the idea too expensive and unsustainable for the environment. According to legal and financial expert Dr Nicola Ritter, the air-conditioned stadia are likely to cost around £30billion, with another £48billion to be spent on training facilities and accommodation for players and fans. New plans for the construction of the first of the six stadia, the Zaha Hadid-designed Al Wakrah Stadium, located in the historic port city 15 km south of Doha were showcased in November 2013. The architects revealed some ambitious plans for a stunning 40,000-seat venue with a somewhat controversial design, said to have been inspired by local Arabian dhow fishing boats. Mischievous commentators have suggested that the design is actually reminiscent of something altogether different, but that doesn’t seem to be discouraging the architects at all. The impressive stadium will feature a modular second tier constructed from engineered timber so that it can be dismantled and shipped out to developing countries once the games are over, reducing the capacity to 20,000. The removal of the second tier is another nod to the Qatari’s commitment to proving that they can host the tournament in an eco-friendly way. Qatar even has a half-built Olympic-village style city, Lusail, surrounding the stadium that hosts the opening and closing games. This development is estimated to be costing the country another £28billion. Expert opinion seems to be divided about whether they will manage to pull it off – even with the best facilities in the world, stadia full of overheated people who are not used to temperatures of 45 degrees or more could lead to the games being branded a disaster. Will ambitious design and some of the world’s best architects make the 2022 tournament one to remember for all the right reasons? Time will tell. Written by James Sheehan, an avid football fan. He will travel to Brazil next year for the 2014 World Cup. Will Brazil 2014 Will Be the End of the Road for England’s ‘Old Timers’? Why Is Football (Soccer) The World’s Most Popular Sport? Top 10 Biggest Sports Stadiums in the World! This entry was posted in Soccer and tagged 2022 World Cup, English Football, FIFA World Cup, football soccer, football stadium, Lusail, New Doha International Airport, Qatar, sports and lesiure, sports and recreation, Sports Archives, Sports Blogs, World Cup, World Cup 2022, World Cup blogs, World Cup venues. Bookmark the permalink. 1 Response to The Sports Archives – The Richest Football (Soccer) Stadium In The World?